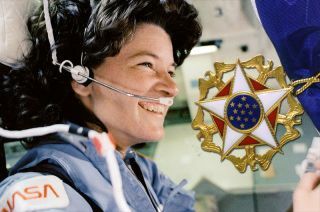 Astronaut Sally Ride, the United States' first woman in space, will be posthumously awarded the Presidential Medal of Freedom during a ceremony at the White House in 2013. Sally Ride, the United States' first woman in space, will be posthumously honored with the country's highest civilian commendation and the renaming of a high-flying camera. President Barack Obama announced on Monday (May 20) that Ride will be awarded the Presidential Medal of Freedomat the White House later this year. NASA further paid tribute to the late astronaut by creating a new internship program in her name and renaming a science instrument on board the International Space Station. Ride made her historic first spaceflight 30 years ago next month, on June 18, 1983. "We remember Sally Ride not just as a national hero, but as a role model to generations of young women," Obama said in a statement released by the White House. "Sally inspired us to reach for the stars, and she advocated for a greater focus on the science, technology, engineering and math that would help us get there." "Sally showed us that there are no limits to what we can achieve, and I look forward to welcoming her family to the White House as we celebrate her life and legacy," he added. Ride is only the ninth astronaut to be awarded the Medal of Freedom, joining the ranks of Mercury astronaut John Glenn, first moonwalkers Neil Armstrong and Buzz Aldrin, and Apollo 13 commander James Lovell, among others. NASA is also recognizing Ride by renaming a camera on board the International Space Station (ISS) as the "Sally Ride EarthKAM." The space station camera is a NASA outreach program enabling students, teachers, and the public to learn about the Earth from the perspective of space. During EarthKAM missions (periods when the camera is operational), middle school students can request that photos be captured based on their classroom investigations. The resulting archive of Earth imagery and accompanying learning guides and activities support lessons in Earth and space science, geography, social studies, math and even art. The project was initiated by Ride in 1995 as "KidSat" and first flew on three space shuttle missions (STS-76, STS-81 and STS-86) to test its feasibility. In 1998, the program was deemed successful and renamed ISS EarthKAM. The camera then flew on two additional shuttle missions (STS-89 and STS-99) before moving to the International Space Station in 2001 with the orbiting lab's first expedition crew. The ISS EarthKAM camera has since been a permanent payload aboard the station, supporting about four missions annually. NASA's educational outreach camera aboard the International Space Station (ISS), the ISS EarthKAM, is being renamed the "Sally Ride EarthKAM" in honor of the late astronaut who initiated its use. NASA's new Sally Ride Internship will help students from underserved backgrounds pursue a research interest at its nationwide centers. As many as 10 internships in total will be available in the spring and fall semesters of each school year, giving students the opportunity to work side by side with scientists and engineers. NASA Administrator Charles Bolden announced the ISS camera's renaming and internship during a national tribute held on Monday evening (May 20) at the John F. Kennedy Center for the Performing Arts in Washington, D.C.
"Sally's impact on our nation and future generations of explorers is immeasurable," said Bolden, who served with Ride as a NASA astronaut in the 1980s. "Godspeed, Sally Ride, and thank you for reminding us to reach higher, break barriers and dream big." The U.S. Navy also posthumously honored Ride with the christening of an auxiliary general oceanographic research ship. Set to join the fleet in 2015, the R/V Sally Ridewill be the Navy's first academic research ship named after a woman.